Do you use a socket extension lead or adaptor somewhere in your home or business? Most of us do these days because we have so many plug in appliances and often don’t have enough wall sockets to run everything. 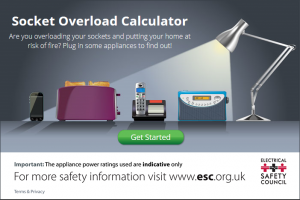 However, how do you know if you are overloading a socket? You may think that if you have an extension with 4 outlets that this means you can plug any 4 appliances into it but this isn’t the case and is widely misunderstood. Our electricians often see multiple extensions/adaptors plugged into each other running all sorts of appliances including heaters, kettles and other such high power appliances. It’s frightening when you realise that the original wall socket into which these extensions and appliances are plugged is only designed to take a load of 13 Amps. An extension lead or adaptor allows you to plug more than one appliance into a wall socket but the total load of those appliance must not be more than 13 Amps otherwise you risk overheating and could possibly cause a fire. A kettle is 13 Amps on its own so should never be run off an extension lead with other appliances being used off it at the same time. Whereas PCs, printers, telephones, routers, etc. are generally low power appliances so it’s not a problem to have them running from one extension lead. You can try the new electrical safety council ‘Socket Overload Calculator’ now available on our website to check the power rating and load of appliances you have plugged in together on your extension leads or adaptors … try it now, it’s really quite interesting!